In this episode, we speak to our guest, Judy Dow on a praxis of abolition. She is a basketmaker and educator of over 30 years and is currently working on a book entitled Returning To Ourselves. She shares her praxis connecting mapping, stories, navigating the narrows, and learning from the land. LS: Hey Listeners. Welcome back to Abolition Science Radio. We are excited to bring you yet another episode. Atasi, what will we be talking about this episode? AD: Well in this episode. We will be talking about the praxis of abolition. And more specifically a praxis of abolition science in the classroom. But do we mean by praxis, well LaToya, what do we mean? LS: Well, there are various ways that people engage this term. But we are going to think about it as the intersection of where learning, thinking and doing meet. 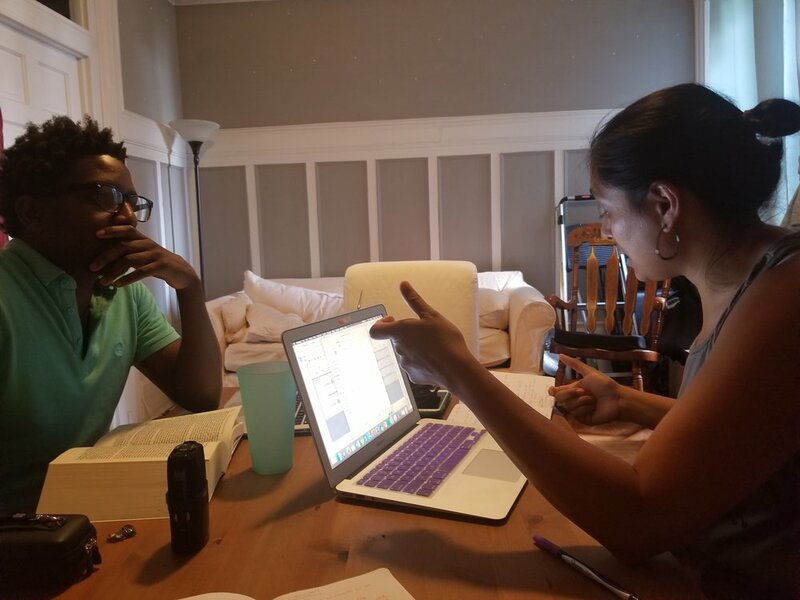 And so, this episode and next episode will look specifically at the praxis highlighted by some folks who we think are embodying abolition science and the work that we do. So, who are we bring on today. AD: So, in this episode, we’re gonna be talking to Judy Dow and she’s an educator of over 30 years. And she’s also this renowned basket maker. Her baskets have been displayed at galleries across the country such as the Smithsonian which is in Washington D.C. And she also has this long history of writing and organizing through this organization called Orate. And Oyate is this Native American/ American Indian advocacy group and education group that organizes to serve, as they call, “The People”. Um, that’s what Oyate means. So, you can check their site out at www.oyate.org. LS: So Atasi, why Judy Dow to talk about the praxis of abolition science? AD: Judy (J) has an incredible amount of experience working with children teaching and talking about integrated ways of knowing the land and their own histories. So, let’s just listen in and see what she has to share. AD: So, welcome Judy, to Abolition Science Radio, we really appreciate you being with us today. Uh, could you just share with our audience. Where are you calling from? Uh, and, in addition to where are you calling from, what is it that you’re currently listening to or reading, or watching that captured you? Judy [J]: Well, I’m up in Northern Vermont in Essex. I’m sitting enjoying the summer, for the past couple weeks, it’s been way too hot to do much of anything but read and write and make an occasional basket and that’s what I’ve been doing. Um, I’ve been reading a book Lisa Brooks wrote, um, came out this winter called Our Beloved Kin. It’s um, about King Phillip’s War and there’s a chapter in the book that focuses on Mary Rowlandson, a captive that was taken along with some elders and women and children up through Vernon, Vermont. So, I’ve been reading that. And I’m working on a book with Sonya Atalay on mapping our stories. Rutledge, um, Publishers have picked up our proposal to create a textbook. And um, we haven’t really fine-tuned our title yet but it’s gonna have something in it that relates to returning to ourselves, um. I’m also writing a collection of essays that I hope to publish on topics, um, that teachers can use to help them teach, um, subjects from several perspectives. Um, and, things like, Co- Thanks- the first Thanksgiving, or Columbus, or appropriate art or literature, um, things that they may have been only taught one perspective. So, I hope to do something with the collection of essays eventually and have them help teachers. AD: Wow, well thanks for sharing all of those really rich resources that you’re reading. The book sounds really fascinating and your upcoming projects. You’re very, very busy, um, it sounds like. J: Yeah, yeah, it’s full, that’s for sure. AD: So, just for our listeners to understand a little bit about some of the projects that you’re working on, um, you talked about this textbook, Mapping Our Stories, and this collection of essays. Could you tell a little bit about maybe, um, you know, yourself as an educator, what you educate around, um, just a little context about as um, what you do in Vermont. J: Sure. Um, I, um, taught in a classroom for fifteen years. And, then, um, eventually moved on to doing residencies in schools. Um, throughout the country actually. But, um, lately, a lot in New England, and, a lot of, um, my redirection had to do with the way I looked at things. Um, my colleagues were often teaching exactly what they had learned and not really seeing another perspective, not seeing a new direction, um, looking at the world as being flat and not even considering it could have been round. So, in teaching about global warming, I work with students to, to help them understand that we live in a world with a limited number of resources- plants and animals and clean air and water. And, we’re gonna go through the narrows into a new world and this new world will be a place where all systems that we know are broken. Similar to what you see in the headlines in Puerto Rico. And, I want students to understand the process of making it through the narrows into this new world in order to help them survive. And part of that process of surviving is learning to read the land. Learning, um, understanding how the rivers meander, the currents in the water, um, where is a safe place to shelter on the land. Those things have all been forgotten and the, the second reason I’ve started teaching children of the- about reading the land is because they’ve been taught for generations that things are sustainable if you have enough money and I want them to understand that the rules of engagement don’t include having a lot of money and things aren’t necessarily sustainable just because you can buy something or fix it with money. So that’s kind of how, why and how I started moving in this direction and now I travel about New England, teaching about sustainability and global warming and how it might impact them and how the flooding and the changes in their environment are impacting them. AD: Well. Yeah, you wanna ask? LS: Yeah. Judy, you mention um, one perspective - this phrase on perspective and then bringing in other perspectives. Could you maybe talk a little bit about what that- generally what that one perspective is and what moving beyond just one perspective could do for us? Just as a society? As a world? J: Sure. So, it’s kind of, like, looking at a penny. Many people will look at a penny and they’ll say ‘oh, it’s a circle.’ But then, if you turn the penny just slightly, it becomes an oval. Which is another perspective right? It has an oval. And then if you turn it just a little bit more, and you see the edge, it’s a flat rectangle. And so there are often three perspectives, sometimes many more, and I look at all of these perspectives - consider all these perspectives and try to teach the balance in the middle. The perspective that a lot of people don’t strive to see. They wanna see it’s black or it’s white, (LS: Mhmm) they don’t necessarily wanna see that there might be grey. And so, to determine if something’s sustainable, I use three questions that typically are used around the world. Like does the practice support reducing energy use? Does the practice contribute to lessening man-made waste? Is it somehow helpful to the environment? But then I add this fourth question and most people, most institutions around the world don’t use this fourth question: is there fairness to all living things? Human and non-human. And when you ask that question, when you look at that question as to whether there’s fairness, it totally changes the story and that’s how you can truly determine if something’s sustainable. And, our language, the Abenaki language has a lot to do with that. So, if you know the indigenous language of um, an- that things are animate, or things are inanimate, then you can understand how, something can be living. For, for instance, a mountain. If you talked about a specific mountain, it’s animate- it’s alive, it has meaning, it has life. But if you’re talking about the mountain within the mountain range, it’s inanimate. And so, those things get lost in today’s society and, but they’re very important if you want to be able to find your way through the narrows and succeed in the new world. And so, when I work with students, I help them to create maps and, our maps are not just 2-D pieces of paper. They’re mnemonic devices that help them to retell the story- to remember what they’ve learned and how they might use it or share it. And in that process, I teach about the five R’s. Which are: respect, responsibility, reverence, reciprocity, and relationship. And again, in this world of technology, it’s often difficult for them to understand developing relationships with plants or with animals or even birds or understanding that it’s their responsibility to have the respect for these things if they’re expected to depend on those when they go through the narrows in the new world. AD: Yeah, um, I definitely, it makes me think of this concept that you’ve mentioned a couple times now: through the narrows as well as reading the land. And just for uh, listeners, and for ourselves, just where does that notion come from? You mentioned the Abenaki language um, who are the Abenaki people, uh, can you explain a little bit about some of those concepts that were, you’re proposing, you’re, you know, reclaiming and reasserting. J: Sure. So, in reading the land, if I mentioned to students, to younger students, we’re going through the narrows, they have no clue what I’m talking about. And for me, I grew up on an island, in a series of Islands in Lake Champlain, and there were lots of narrows and the narrows had many lessons because there were lots of snags and rocks and the current runs differently on each side and within the center of the narrow. So, you quickly learned how to navigate narrows. You learned when the fish were spawning, where they were spawning, which side of the narrows they were gonna be on and you learned the importance of the narrows. And how it was this bridge between two completely different worlds- one on one side of the island and one on the other side of the island. And um, so I started using that as a metaphor and quickly realized the students could not only read the land, but they did not understand the word narrows. So, I have to start each class off with an explanation of what the narrows are cause it’s something that has been lost over time. And, the, Abenaki people who live in Vermont and New Hampshire and Maine and Southern Quebec have always been able to navigate these waters and to understand the importance of the narrows and we have traditional stories that refer to the narrows and their importance and, I see in the way I was raised that, that knowledge being passed to me and I’m trying to pass it to students in an effort to help them make it through climate change. AD: Ok, yeah, really helpful to think about how it’s this really interesting, um, process of taking this knowledge. The deep lessons of the land to so many aspects of life and it sounds like land is central to, to those lessons. To your pedagogy, um, I don’t know if you have examples to share or, or if you could talk a little bit more about how other aspects of the land that’s around you or that’s changed that you use in your pedagogy. J: Oh. Yeah, I have a lot of them, ha ha. I have a lot of stories. Let me give you an example of Montpelier. Montpelier is the capital of Vermont, it’s a fairly large city and we’ve had some recent floods um, it’s been flooded for a long time. There were huge floods in 1927 and 38 and 2011 and now these floods are getting more frequent and FEMA dropped insurance on 306 buildings including the police, the fire, and two schools in Montpelier because they were in a flood plain. And, so the teachers of the school came to me and said, can you help us understand? Can you help us figure out why FEMA has dropped insurance on our school? And my way of teaching includes, exploration and experience and observations. So I divided the classes up into groups, gave them GPS’s and we walked over five miles every day. Each day we were marking elevation of certain places. We looked at very old pictures of what was underwater and the places we had walked, and we looked for signs of water damage on some of the buildings and then in the afternoons, we would do research. And try to figure out what was going on and, we went way back and found stories of, like a man, building a log cabin in the spot right across, right across from where the capital is - the state capital. And before he’d gotten the third hole for footing dug, the first two were flooded. And so the kids were trying to understand how that could be and so then we started to take our elevation markers and look at history prior to European settlers. And when we created the map of the elevation and looked at the very old stories, we discovered that Montpelier was in the bottom of an ancient lakebed 100 feet deep and two miles wide. So no matter what they did, every time there was a high-water event, Montpelier was gonna flood. They were in the bottom of the lakebed. And so, we continued to do research and found out that the European settlers created one law after another to protect the settlements so for instance, it became a class issue at one point and they prevented anybody from building log cabins in this area. They could only build brick or stone houses because when the water came the logs would float and destroy the brick and stone houses and so then we compared them to the native sites and wonder- the archaeological sites that show- reports that show where native sites were and wondered why they weren’t having problems with these low lying intervales. These low-lying areas where the Europeans were settled. And what we discovered was, they didn’t settle there. They settled high on the points that overlooked the valley. Because they knew, and we have a very old traditional story about white monsters coming every spring and so you shouldn’t live in these - intervales, in these low-lying valleys because the white monsters will destroy everything. And of course in this story, the white monsters are the ice floes, the big chunks of ice, which is what happens to Montpelier now. So, um, that’s just one story. I don’t know if you want more but that approach to teaching comes with just taking them out on the land, doing the research, um, doing observations, and using the tools they were given in life- the five senses that they have to observe and understand the water and tack on the research of the old documentation, they were able to figure out why FEMA had cut insurance to their 306 buildings. AD: That sounds like a really deep learning process. And for myself I wonder how that research process, I mean that- there’s a lot of collecting and finding things and with the educators that you’re working with how did you go about finding some of the old pictures or some of those historical archives? We’re located in New York City for example, which has a plethora of different places to access but for other locations and other places and cities and maybe smaller towns, uh, I’m curious of how you, and other educators went about that process of, archiving- archival research I guess. J: Well, um, each town as you said is different. And the teachers themselves had resources as did I but the- in this particular town. Montpelier was the capital so, the state archaeology office was there, the scientist who studied the river was there, um, the state historical society was there so we had all these things that we could tap into. But, before I- before I forget, I just wanna throw this in there too. So once the kids had learned the story, um, they felt obliged to teach their parents. So they created this huge mural. And we created QR codes every place we had gone with the GPS’s the kids told the story of what they had learned right there, we put the QR codes on the map and then we displayed the map for the public so you could put your phone up to the QR codes and hear the story of that particular site and elevation and so then that became a resource for the community. Um, in other towns we’ve done other projects, but that similarly became a resource for the community. But, in small towns there’s town offices, there’s town libraries, there’s town historical societies and I’ve tapped into the historical societies often and many times they’re older people that just love working with the children. Um they give perspective sometimes of actually seeing it, hearing it, and experiencing it as well as sharing documents that help to tell the story and so then again, it becomes this event for the students to take all the perspectives, find a balance in the middle and create a story they want to map out. AD: Yeah, sounds really amazing, that whole process. Thank you for sharing that. LS: Yeah, I’m li- listening to the stories that you’re telling and something that’s coming up for me is this like listening to the land as a way to understand what is happening. So what’s what does the land tell us? Um, and I’m wondering if you could help explain to our listeners, like why is this important for us to take up? Fo- uh, focusing on the land. J: Well, it’s something people have gotten away from. And, um, over time, cause they like to go to their tablet or their phone and google something and they get the answer, or they think they get the answer. But I’ll tell you two little stories to answer this. A long time ago I learned to make a traditional basket out of red osier, which is a member of the Dogwood family and when I was taught to harvest and the materials to make the basket, I was taught to make two. And one needed to be reburied after I was done as a thank you, as reciprocity, as a gift to the red osier for sharing. Now the red osier is typically a plant you see along waterways to help the shorelines from eroding. So when you bury this basket as a thank you to the plant and you give it back to the plant, the buds that were on the materials you used to make the baskets start sprouting and new plants come up so there’s like new babies for the gift of the plants. That story of listening to the land and giving back to the land that it needed more from what you just took gets passed on that way. And then the other story I wanna tell you is um, about Brandon. So there’s an elementary school there called Neshobe which is an Abenaki word for full of water. And they’ve kind of forgotten what their school name meant, and they live in the crossroads of several rivers and this was the third and the fourth-grade classes I was working with and, they wanted to map out the story of what was happening in their town. Their favorite pizza place had been flooded. It’s a very small community with the town green and one pizza parlor. And the center of town got flooded for like the umpteenth time, but this particular time was traumatic for these third and fourth graders because their favorite pizza place got bumped into the office landing and into the middle of the road and they were devastated that they were gonna lose their pizza parlor. So, they wanted to understand that. And, um, we had a dump truck of sand brought into the playground and dumped in the backyard. For a day, we played in the sand, rearranged the sand to look like the town. We put the roads in, we put the riverbeds in, and then they created- using little milk cartons- they created houses and businesses and they set up the whole town just like it looks. And then, it rained. And when it rained, the, the buildings flooded in exactly the same place it had flooded for year after year after year. So, they knew they had to listen to what the land was saying. (LS: Mhmm) Because they knew in their lifetime, it had flooded in the same place it had flooded in their parents’ lifetime and so on. So, they created this proposal and the research they had done to share with the school board and the town manager. And they told them about their experiences and what they had learned, and their conclusion was they they needed to move the center of town. It was gonna flood again. And, they were somewhat not believed, but, but people just didn’t wanna believe it because to their little town, the center of town, the town village was where everything happened. (LS: Mhmm) It was a little tourist town, it was a place where there were cute little shops and brought the tourist community to their town and they couldn’t visualize how the town could survive. So the town voted to not change the center of town. (AD: Hmm) They voted to rebuild it once again. And this is a familiar story. I’m sure you’ve heard of other places. I’ve been back to Neshobe several times since and we’ve done various projects each time. Each time I ask, so what’s going on with the town, what’s happening? And, I’m told we’ve gone through four town managers and our fifth town manager is threatening to leave now because the science shows, the research shows, the village is gonna flood again and they’re gonna have to rebuild again but the community refuses to accept it (LS: Mm) and rebuild the center of town someplace else. It’s interesting because I keep thinking if I keep educating the children, they’re gonna figure it out all by themselves just by research and experiences and observation. And they do, but then the elders don’t believe them, and, so we just have to be patient and wait till those kids get to be in the position of power and change their community. AD: You bring up a really interesting aspect, to the stories that you’re sharing, the experiences that you’re sharing, that I wanna understand a little more you know. A lot of this research and this work that really motivates people to change the conditions that they’re living in, or with young people. You’ve particularly talked about third graders and fourth graders which I’m sure who have great respect for, kinda, the learning that they’re picking up from the land as well as from their other teachers but um, because they’re like third and fourth graders they have their homeroom teacher, they have other educators that they’re around. How has the work, how have you engaged this work along with those teachers? And, what are their reactions? How do they take up- such it, it seems like such an impactful learning experience. J: Well, at first, they’re really, they’re really hesitant because it’s something different, it’s a way of approaching learning that they’re not used to. They’re not used to going, um, out onto the land and learning. They’re used to opening a textbook and learning, right. And so it takes a lot of, pretraining um, with teachers before I actually go in and do a residency. Cause they need to understand where I’m coming from, I need to understand what their final goals are. And, we need to come together to formulate a plan for the week. And so that takes a little work. A lot of prep time and um, is included in that. The older the students, the more prep time it takes because (LS: Mhmm) with younger students, they’re self-contained in a classroom. Like, in middle school, they’re going to many classrooms so then you have to tie in many teachers that are sharing time, right. (AD: Right) And high school’s the same way. And so it becomes a little more challenging with middle and high school but it’s so doable. It also what comes into play in the planning is the topic. What is the topic that they want to go with. What is their theme and some schools actually have a theme for the month and other schools have a curriculum that they follow and so it may be history, it may be science, it may be math, whatever, but I have to be able to adapt my format to what it is they want to focus on. And they need to adapt to my process. And so, consequently, the important thing between all of this is trust. And so, all that pre-planning helps to build trust. AD: Yeah, I’m sure. It’s so interesting to think about all the different types of classrooms, you’ve, you’ve been in and to think about uh, middle school and high school. That dynamic of really negotiating the time and all these different interests. That is such an important trust building process. I’ve known you for several years now and have known some educators that you’ve worked with who love, you know, and I’ve really come to really understand the depth of your work over the years. Could you share maybe an experience or two or some kind of lessons for educators that are- who are hesistant- of what is it that eventually helped them come to trust this process? (J: Hmm) Cause it’s really. It is, it’s such a different way of learning and it goes against kinda the grain of getting ready for tests or you know, how do I meet all these standards? Every standard seems like it’s its own unit so if you’re doing this, you’re taking time away. Can you maybe share a time when that reluctant or really hesitant educator has kind of opened? And so these kids were really able to think deep and even in kindergarten and first grade, um, I gave them a full sheet of paper. Asked them to color- watercolor the background of their story um, and so it was a flat sheet of paper, we worked on- focused on filling the whole paper with sky and ground and hills and everything. And then, we folded the paper in half and let it set up like, like on your computer, laptop right. (AD: Mhmm) And they used clay to put the figures into the, the background they had painted. Even their stories addressed amazing social justice issues. And so, the teachers had the time that I didn’t have. They had weeks and weeks to match up with their curriculum and teach the children about social justice. And then I had a week to come in and fine tune their research and get them to put it in story format. It just turned out to be a really great way. That by the way, took, um, let’s see, probably five different meetings after school with the faculty to coordinate how we were gonna do that. And to build the trust, um, that they could give me their children for a block of time and that I was gonna connect with the topics that they were studying in their classroom. It took a long time- but we figured it out and it went really really well. AD: Thank you for sharing that, yeah. That was, everytime I hear all the different accounts and stories, I just like imagine myself in the scenarios and it just is, it’s really poignant, it’s really moving. J: It is, you know. And I did a class in middle school in Springfield, Vermont and of course they have periods right. So, I’m looking at this one team of kids and there were five teachers involved and it was like the same process as dealing with Weybridge because there were six grades and six teachers, right. But, in Springfield, they were all in the same team, so we had to go through the same process and the teacher that’d asked me to come wanted me to focus on Eugenics. And so we got the school bus for two days and we traveled around again with GPS’s documenting various stories and we kept coming to this one guy, John Nott. John Nott first lived here, this was the first house built in Springfield in 1751. And then he was considered a squatter and he had to move, and this is where he moved, and this is where his ferry was, so we kept coming to all of these places, and finally I’m like, who’s John Nott? So, we get back to the classroom and they show me all their textbooks, and on the history of Springfield, we went to the library, we got all the ones they had there. And every chapter started with John Nott and told me everything they knew about him. You know, he was the first settler, he did this, he did that, he helped build this trail and that trail and I’m like in 1751, how did he survive? Cause there was native people living there, right. And so, in the books, it says, he survived because he had a clever plan. He told the Indian people living there his wife was a half breed. So, that first year he hadn’t finished his home and they allowed them to live with the native people, so he survived. Happily survived. And I’m like, that just doesn’t seem right to me. So, we sat down, and we did the genealogy on her family. And her family went- her parents were from Connecticut, her grandparents were from Connecticut, but they had originally come from England. And so, his clever scheme was to lie. (A & LS: Hmm.) And they had a pile of textbooks that they have been taught till they go to middle school that he was this great forefather. And they themselves discovered the history that he survived by lying. And the interesting part of that is, I usually ask the teachers to do some kind of sharing after I complete a residency. So, this particular teacher chose to do a community wide presentation of their projects and their maps and, it had- a reporter had come and talked to the students and the students had told the story that John Nott had lied and so we expected like 30 parents to come and the kids had prepared snacks and drinks and we’re presenting at the town library. And 100 people plus came, teach- old retired teachers, historians politicians, came because they wanted to know the story of John Nott. They wanted to know how they had- these middle school kids had discovered that story was not true. And it was so simple. All they had done was the genealogy. AD: It’s really interesting. It makes me think about all the different ways that students are entering these stories and retelling them or broadening them and really kinda shaking things up. Who are some of these students? Are they, um, cause I think of Vermont as mostly a white state? and having maybe people being there for generations, um. For some listeners who don’t know, I also was teaching in Vermont for a number of years, so. I’m thinking of the community that I was in. So, who are some of the students that are doing this discovery process? Um, and why is Eugenics particularly really important for, to kind of like talk about as a part of the history? J: Well, the students for the most part are public school students. Occasionally I’ll work at a Montessori school or a private school but for the most part they’re public. Um, and the story of eugenics is with us today. People just don’t recognize it because it has a different name many times, but it’s still here with us. And, it has deep roots that go way back to the beginning of the creation of America. So, when I go in to do a project with students on the history of eugenics, I connect that past so that they can understand today. Because I believe if they know the past and understand today they can direct the future in a good way and so it’s important to me, that they learn to identify, and they see it in the world around them today. So, if someone stands up in front of you and says ‘Yeah, I am successful cause I have good genes.’ (LS: Mm) That whole way of thinking comes from eugenics. So, Eugenics was a program that 31 states ran in 1920s and 30s to breed better people, um, to weed out those they believed to have had a defect, were dependent, or were delinquent. Um, many of the scientists here communicated with Hitler’s scientists back and forth, you can see in the documents- letters going back and forth with questions like, ‘How do you get the general public to understand that this is a good thing?’, and the scientists here will say, ‘Hit ‘em in the pocketbooks. Show them how much these feeble-minded people are costing them.’ And we hear a lot of that kind of talk today, right? (AD: Mhmm) And I often will take that past story and connect it with news headlines from today. And so they get that history but they also in my mind need to understand, they need to create this mnemonic device that will help them to re-tell the story. So, there’s this part of the story where students are taken out on the land, and in many cases again, we’ll use GPS. We’ve done the research where the targeted people lived, we’ve done the research where the eugenicists lived. And we travel around, and we create waypoints as to where they lived. And the story is always the same. The story is always connected to the land. The people who were targeted lived along the rivers, the waterways. The people who did the targeting lived up on the hills, in the high points, where the wealthy lived. And so, it brings into discussion how the land is used to keep people in classes. It brings in the discussion of how people today homeless people still want to live near the waterway. Why, well they need the water. They need the water for drinking, for cooking, for washing, we make all of these connections through time and so, eugenics is. My family was the largest family targeted in the Vermont Eugenics Survey. (AD: Oh wow.) 623 people in my family were hunted and tracked down and some were institutionalized, and some were sterilized as part of this program and it’s something I will always remember. Actually, I will never forget and it’s something that as people learn to go through the narrows, they need to know this history. They need to know it existed in the past, it’s still with us today and it could walk through the narrows into that new world. Where people with money can buy what they need to survive or like, in the case of Puerto Rico, many of those people with money came to Florida (LS: Mhmm) to get away from the problems, right? (AD: Right) So I think that that they need to understand all the political implications of eugenics in the past and understand that it’s with us today. AD: That theme has really been present I feel like throughout all the different stories you’ve shared, that history and current, and the connections- always the connections. I wanted to ask maybe one last question before we wrap up some of about you’ve talked a lot about the different kind of resources and tools you’ve pooled together to kind of help this process, but if you could share maybe, do you have any, uh, particular resources or tools that help you with your work? J: Um, yeah, I think GPS helps me to teach the kids in a way that they know far better than I. Which is digital. And then from that digital component, that digital map, they can create so many more things. And so the second tool that is really important to me is imagination. How can the students use their imagination to take that digital map and create something new to tell the story. Whether it’s burning on a gourd, or a piece of leather, or weaving a basket, or a textile, you know, something that traditionally has been used to tell stories that they can bring back and reclaim and use once again to create the mnemonic device to tell a story. LS: Yeah, thank you, and so I also have one final question for you, Judy. I’ve only met you once and it was in that one meeting when you came down to New York to work with us. That was just such a transformational experience for me as an educator. And already like using some of the tools that you taught us then in my practice, and I’m wondering if you could just talk to us about how you’ve changed as an educator over time? J: Oh wow, I guess the older I’ve gotten, the more I’ve realized it’s ok to speak out. My father used to say to me all the time, ‘I can’t believe you- people pay you to talk. I can’t believe you tell them all these stories. I’d pay you to shut up!’ (A & LS: Ha ha ha ha) And he would say those things to protect me cause he went through that eugenics period. He knew if I spoke out, that someday I would become a target. Even as an adult, he was still trying to protect me. And so, I think, that still weighs heavy on me, but I went to my first rally this year and then I went to my second rally and I was actually one of the speakers in the rally. (AD: That’s great!) (LS: Wow) So more and more, the older I get, the more I realize how important it is to speak out. And, keep speaking out. And that’s why I agreed to be here today. In part because you always hear if you don’t know history, it’s gonna repeat itself. (LS: Mhmm) And, it’s not that it’s going to repeat itself. It is repeating itself. (AD: Mhmm.) (LS: Yeah). It’s repeating itself, it’s right in our laps and people need to wake up, stand up, and speak out about it. (LS: Mhmm) Cause, it’s there! So, I guess that’s the most important part of how I’ve changed is just speaking out more than I ever did before. AD: Well thanks again Judy for sharing all of that and for (LS: Yeah thank you so much) for inspiring (J: You’re welcome) uh, us. And hopefully our, our listeners to do that. To do exactly that, to speak up. I just wanted to, mostly I want to thank you so much and see if, are there any upcoming projects or if there’s contact information that you wish to share on the radio, on this podcast, or how can listeners support your work? J: I have a book coming out in art- a book that I did a chapter in in October. It’s called, um, Reconciling the Past, Engaging the Present, Animating the Future. It’s a Global Indigenous Health textbook and I’m Chapter 4 in the book. And I tell the story of eugenics in that book. And, University of Arizona Press published it, it’ll be out in October. And I’m doing an exhibit down in your way at Queensborough Community College. (AD: Great) Not sure of the date but that’ll be coming. And I am still embroiled in the battle over Dorothy Canfield Fisher, which is one those issues I have chosen to advocate for. And Dorothy Canfield Fisher was an author who was born in Kansas and lived part of her life in Vermont. And for 61 years, Vermont has had a children’s book award named after her. And normally, that would be fine except that Dorothy Canfield Fisher was a eugenicist. (A & LS: Mhmm) And she wrote many essays and publications and state brochures to encourage eugenical beliefs in this state. And, so since April of 17, 2017, I’ve been on a campaign to get the name changed. If anybody wants to write to the governor of Vermont and ask for a name change, that would be great! So that would be really good support. As you know, they changed the book award after, um, Laura Ingalls Wilder. (LS: Mhmm) They just recently changed that, (AD: Right) you’ve probably heard about that. (AD: Yes) And um, I’ve been working on this for about a year now. And it’s kinda confusing to me because the Vermont State Library Board agreed to the change. Vermont State Library Association agreed to the name change, and the Dorothy Canfield Fisher selection committee it changed, agreed to the name change. But it seems to be hung up with the State Librarian whose boss is Governor. Um, they’re not making a change, so the battle continues. (AD: The Governor. Right.) Right. Um, so the battle continues with that and if anybody wants to speak out and write up on that, that would be great because it’s just one of those things where eugenics comes back to haunt you and hits you back in the face again. And it’s, some of that trauma, um, historical trauma, you just can’t get away from. AD: Ok. We’ll make sure and add some of that information on our website, (J: Ok) uh, where you can listen to this podcast. More than one time. A & LS: Ha ha ha ha. AD: Anyway thank you again! J: Can I, uh, one more thing too? (AD: Sure!) You had asked before if there was a book I would recommend. (AD: Yes!) And, there’s actually two I would recommend. (AD: Great.) One is called Syllabus by Lynda Barry. It’s a book by a professor that shows that you don’t have to be an artist to map out your story- to tell- to create something to tell your story. And, it’s written in journal format. Um, it was activities she’s done with her students. And, it’s just phenomenal. The second book is Unflattening, U-N-F-L-A-T-T-E-N-I-N-G by Nick Sousanis. And it was this young man’s dissertation and it’s a graphic novel. And again, he portrays how visual information can shape our understanding. (LS: Mhmm) And it’s just so amazing to see the process he went through in a graphic novel. it’s just another way of looking at things in both of these books that I think are great. AD: Thank you for sharing that, I will have to check them out. AD: We hope you enjoyed that interview with Judy Dow. Usually we ask our guests to share a song currently on their playlist. LS: True story. And instead of sharing music. Judy shared a book with us and that book is Our Beloved Kin by Lisa Brooks. So check that out. AD: Definitely check it out. LS: Since we’d typically be discussing a song and relating it back to our conversation we still wanted to bring music to the podcast because believe music is incredibly important to any kind of abolition. AD: And it’s really kinda of made this conversation more dynamic and fun! So music is super important, and this really prompted us to create a new segment which we’re gonna introduce. And that’s called ‘Go-To’s’. And our Go-To’s are songs for anything and everything. So what’s a Go-To you wanna share Toya? LS: Ok, so boom. So my go-to song is for when you need to dance off a long week so maybe it’s Friday, you just got home. Maybe it’s Saturday morning and that week is still witchu and so what you’re gonna do…is put on ‘I Wanna Dance With Somebody’ [Whitney Houston in the background] by Whitney Houston and dance the week away. AD: Love that song! Love it! AD: Um, my Go-To song is something that gets me up and it makes me feel like the day is something I have got in front of me. It’s called Golden and by Jill Scott. It’s by Jill Scott. AD: I love that song! LS: I love that song too. 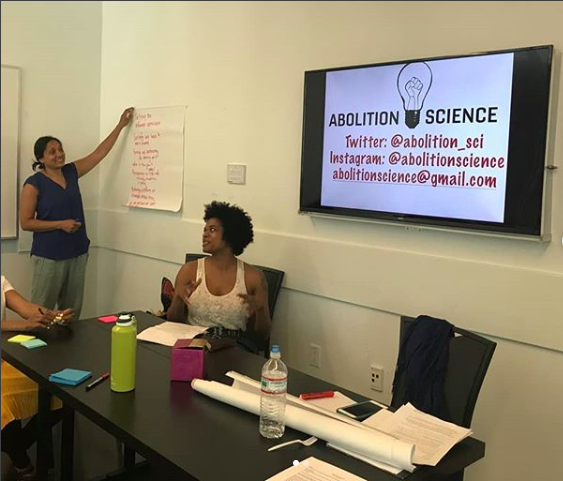 So why don’t y’all tweet us your Go-To wake up song and/or your Go-To song to dance off a long week and tweet us @abolition_sci. LS: And also subscribe to us on ITunes, Stitcher, Google Play, Spotify, or your favorite podcast app and also leave a review. AD: Great! See you next time.